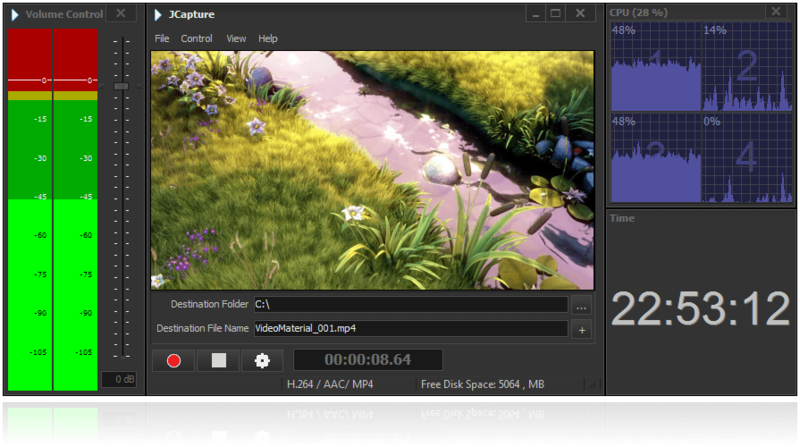 JCapture is an excellent SD/HD SDI and IP Capture & Encoding solution. It accepts SDI, HDMI, Component, Composite, IP – UDP, RTP and HLS (HTTP Live Streaming), and NDI inputs. AVC/H.264, HEVC/H.265 and MPEG-2 video encoding, PCM, AAC and MPEG audio encoding, MPEG Transport and Program Stream, MP4, MXF, HLS (HTTP Live Streaming) and MPEG-DASH (Dynamic Adaptive Streaming over HTTP) multiplex are supported. Our Capture & Encoding solution is a professional product wrapped in easy-to-use graphical user interface. It enables multi-channel audio volume monitoring and control. The product is suitable for automation through the scheduler module. The CPU monitor provides a system processing load overview. The Capture & Encoding solution is multi-threaded / multi-processor optimized. Multiple instances can run at the same time, with different inputs, encoding settings, destination files and schedules. Additionally the solution can produce multiple outputs with different containers, audio and video compressions from a single source. This makes the solution suitable for multi-channel workflows. Audio, video and signal quality monitoring functionality is also available. The monitoring option supports automatic detection of black frames, freeze frames, audio noise and audio silence. It also provides logging and error notifications. All the log files are available for later preview and analysis or third party integration. Along with the manual capturing, the solution allows time-automated capturing through its Scheduler module. This can be used in any automated workflow. Each schedule item can be of a “Single”, “Daily” or “Weekly” type, with a start date, start time and end time or clip duration. The Capture & Encoding solution has easy to build, edit, export and import schedule lists. The schedule lists are exchangeable with the lists created by the scheduler of JIPEncoder. 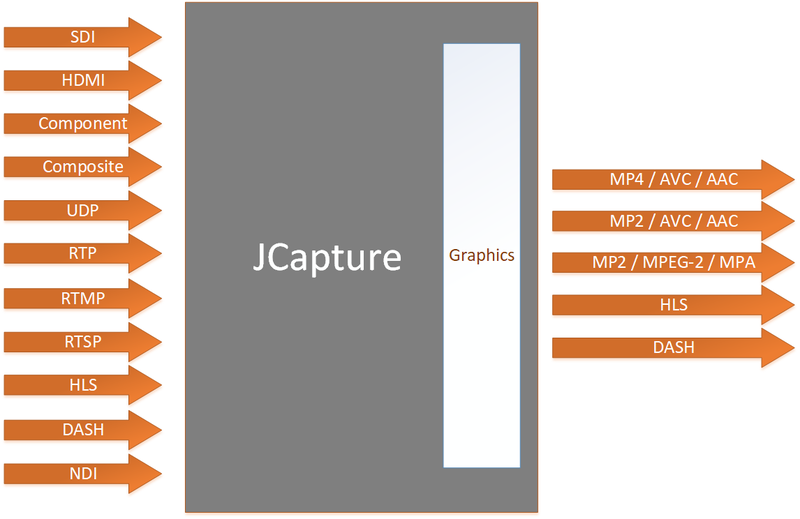 JCapture is multi-channel audio enabled. Our Capture & Encoding solution supports from 1 to 16 input mono audio streams. The audio streams can be embedded SDI, AES/EBU or can be output through balanced analog audio. The Audio Volume module provides audio volume monitoring and control. 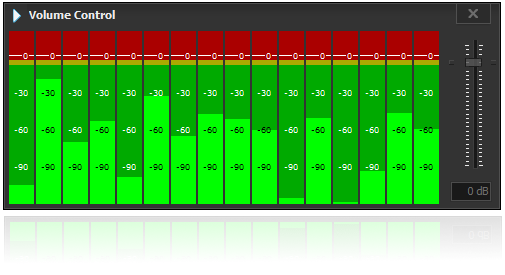 The audio levels are represented in “dB” scale from +20 dB to -120 dB. The volume level can be altered precisely in the preview mode, before and during the capturing process. Our Capture & Encoding solution has now full integration with JGraphics. 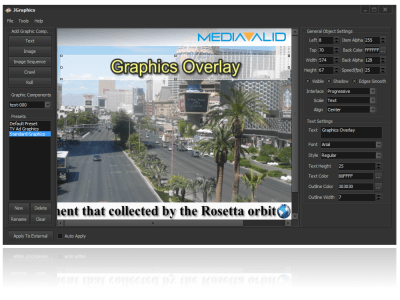 The graphics overlay can be applied on the input video stream and then encoded and multiplexed into the captured media file. Supported graphics elements are Text, Image, Image Sequence, Crawl and Roll. Font, color, outline, transparency can be controled of each element. Live graphics editing mode available. Video pass-through with graphical overlay mode is supported. JGraphics is also built-in in JPlayout and JIPEncoder solutions as well as provided as a stand alone solution.